A new Steam Knight and Steam Gunner that work together appear, designed to swing for huge attacks and seal the opponent’s ability to Guard! AUTO (RC): [CB1] When this Unit attacks, you can pay the cost. If you pay it, during that battle, this Unit gains Power+4000, and if this Unit is Boosted by “Steam Gunner, Shushin”, during that battle, your opponent cannot Call Grade 0 card from their hand. CONT (RC): If this Unit and your “Steam Knight, Shurgi” are both in the same column as this Unit, this Unit gains Power+3000. AUTO (RC) GB1 [SB1] During a battle in which this Unit Boosts, when that attack hits a Vanguard, you can pay the cost. If you pay the cost, choose 1 of your opponent’s Grade 1 or lower Rear-guards, your opponent places that Unit on the bottom of their Deck. For Today’s Card, we’re introducing the following from the 12th Booster Pack “Dragon King’s Awakening” (on sale August 25th, 2017): The 《Gear Chronicle》 support cards, “Steam Knight, Shurgi” and “Steam Gunner, Shunshin”. “Steam Knight, Shurgi” and “Steam Gunner, Shunshin” are cards with powerful synergy with one another. When “Steam Knight, Shurgi” attacks, you can pay 1 Counter Blast to have this card gain Power+4000, and if it’s boosted by “Steam Gunner, Shushin”, during that Battle your opponent can’t Guard with Grade 0 cards. This ability also has the charm of being able, and with “Shushin”, you’ll be able to swing with a 21000 Power Attack, that also restricts your opponent’s Grade 0 cards, allowing you to put intense pressure on the opponent early on. 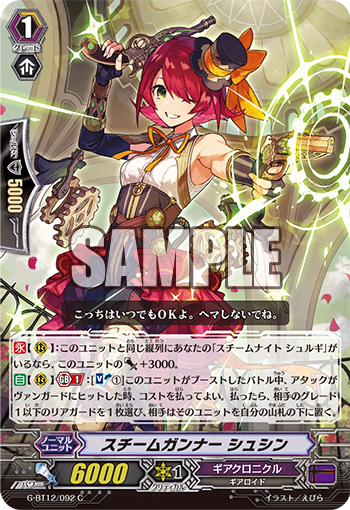 “Steam Gunner, Shushin”, when an attack Boosted by her hits the Vanguard, you can pay with 1 Soul Blast, you can place 1 of your opponent’s Grade 1 or lower Rear-guards on the bottom of their Deck! Also, if there’s a “Shurgi” in the same Column, she gains Power+3000! Which means you can pull off the above mentioned 21000 Power Attack. So by using these two in tandem, let’s push forward in the Fight! After today, we’re also introducing cards from “Dragon King’s Awakening” via “Today’s Card”! Please enjoy!